Page Street Publishing, 9781624142468, 224pp. This new take on mix, place and refrigerate takes no-bake treats to another level with indulgent flavors. 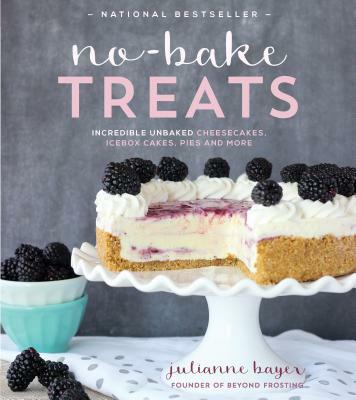 Go beyond traditional desserts with Julianne Bayer’s easy-to-follow recipes that span over many categories with distinctive and contemporary takes on classics that are bound to please any palate. Create exceptional flavors with desserts such as S’mores Lasagna, Peanut Butter and Banana Icebox Cake, Brownie Batter Cheesecake, Coconut Lime Cookie Truffles and Dulce De Leche Pie. Wow your friends and family with extraordinary desserts that pack a punch of flavor without complicated ingredients or tricky cooking techniques. Julianne Bayer is the founder of beyondfrosting.com. She is a Vermont native who won Better Homes and Gardens “Ultimate Baking Challenge.” Julianne lives in Los Angeles, California.